The world is facing a climate catastrophe and businesses around the world must address it urgently or face the ultimate sanction for a public company, shareholders who refuse to back them any more. That is not a message from an environmental action group but from the largest money manager in the UK, Legal & General Investment Management, which manages £1 trillion worth of UK pension fund investments. Its climate warning was the top of a list of concerns about the way companies are run. Other red lights included the level of executive pay, lack of diversity in senior corporate roles, the role (and cost) of political lobbying and the poor quality of the financial information provided by auditors. Legal & General insist that it is not just virtue signalling. The company voted against the re-election of nearly 4,000 directors in 2018 - an increase of 37%. That included votes against over 100 board chairs on the basis of gender diversity alone. Legal & General's director of corporate governance, Sacha Sadan, said it was getting tougher with company boards and managements. "2018 was a record year for us as we continued to engage with companies on a broad range of issues, using our voting power to influence change on behalf of our clients. The increased figures reflect the higher standards we expect companies to adhere to"
The collapse last year of construction and services company Carillion which continued to pay out high salaries, shareholder dividends and get a clean bill of health from its auditors until just months before its sudden liquidation caused widespread outrage and shone a light on the standard of company stewardship in the UK. A recent report from a committee of MPs was sceptical about asset managers' appetite and ability to raise the quality of company management. The business select committee chair said last month: "We do not have confidence in institutional investors in exercising their stewardship functions. We cannot rely on shareholders to exert pressure." Legal & General admit they too have made mistakes. In 2012, the company voted in favour of a pay formula for the chief executive of housebuilder Persimmon that saw Jeff Fairburn awarded a pay packet of £100m. Mr Sadan told the BBC it had learnt its lesson. "Since then we insist that maximum payouts are capped." The VERY best way for investors to exert pressure is to sell their shares - or not become shareholders of misbehaving companies in the first place. Plenty of fund managers argue they are trying to "reform from within" while happily accepting bumper dividend pay outs from companies in some of the most controversial sectors - such as oil and tobacco. Legal & General insist they are prepared to do that and last year issued a list of companies whose shares they decided to dump. The list of eight included Russian oil company Rosneft, the China Construction Bank and Subaru. Legal & General say that all eight of those on the "black list" have been in touch to try and get themselves off it. Proof positive, say L&G, that their brand of shareholder engagement - or disengagement - really works. Many in the UK might find that argument more convincing if the list of no-go investments included companies closer to home that would REALLY feel the cold shoulder of the UK's biggest money manager. For example, Royal Dutch Shell is the UK's biggest dividend payer by miles - offering investors a tempting 5.8% return on their money. Legal & General say they were successful in moving the chief executive's performance targets to be based on safety and environmental improvements rather than raw profit. They were less successful in tackling the sheer amount he pocketed last year - a colossal £17m. For decades, many firms have paid lip service to climate change without substantially altering the way they do business. Then investors joined the climate campaign and began applying pressure from within. Their message is that acting on climate change isn't just a feel-good - it's a necessity to protect long-term assets. 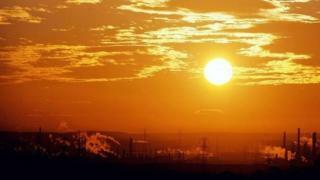 The Bank of England, for instance, recently warned that $20tn (£15.3tn) of assets could be wiped out by climate change. This alarming note is being amplified by fund managers who are pulling their investments out of fossil fuels. They include the World Council of Churches, the Rockefeller family and insurance giants AXA and Allianz. Collectively their portfolios are said to total about £7tn and they'll increasingly influence firms with discretion over their use of fossil fuels. But what about the massively-powerful fossil fuel giants whose very existence depends on mining those carbon compounds the world can't afford to burn? The slave trade was abolished only after traders were compensated for their "loss of human property". Will society need to compensate the oil majors for the assets they must leave underground? Asset managers are effectively the "masters of the universe" when it comes to telling companies how to behave as they have to vote on their investors behalf. But they have powerful customers of their own to answer to. Increasing numbers of pension fund trustees are seeking assurances that their employees' retirement contributions are not finding their way into embarrassing or inappropriate investments. The Church of England was not thrilled to find out its pension scheme was invested in the now defunct high cost credit company Wonga. More recently - and more importantly - was the decision by Norway's sovereign wealth fund to divest itself of some of its fossil fuel investments (paradoxically perhaps - the source of all the money in the first place). But what these examples show is that the savers and citizens, on whose behalf this money is managed, are becoming more aware - and more willing to object - about how that is done.